I wanted to take some time from my normal rantings and ravings about what I like and why you should like it as well and just discuss a number of things that are not related to one another other than all of these topics relate to past blogs. Some of these will be stories about the books discussed and some will be books that have been pointed out to me that I have overlooked when discussing a specific topic (such as my blog on western comics), and I will answer some questions that I have gotten that were sent to my e-mail address that is at the end of this blog. As I am the only one how sees those emails (I think), I thought I would answer those questions in the forum that generated those questions. Of course, I will also recommend a book or two along the way. It is my plan with the next blog to go back to my traditional format of suggesting books I have really enjoyed and I think you will too. First off, a little back story to my last blog about Sheldon Mayer and Sugar and Spike. Back in 2000, I was an Eisner Awards judge. Words cannot express what a great experience that was. But my proudest moment of that whole time (along with meeting Will Elder), was as a judge, we, the judges, got to pick two members for the Eisner Hall of Fame. I suggested and argued for Sheldon Mayer. To be fair, I do not think the majority of my fellow judges were that familiar with Mayer, but after a fairly brief conversation my fellow judges agreed to put Mr. Mayer in, due to his contributions to DCs history from a business point of view, but also his comic work. 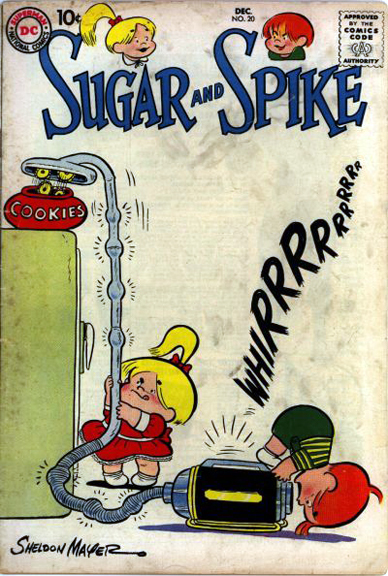 Obviously my driving reason was my love of Sugar and Spike. After the awards I was talking with my friend Patty Jeres, who was still working at DC at the time, and she told me how pleased Paul Levitz was that Sheldon was added to the Hall of Fame, and later that evening, Paul (my former boss at DC), came up to me and personally thanked me for promoting Sheldon as he was a very important part of Paul’s life. That was a great moment for me to have a former boss thank me (even if it was for appreciating someone he also held in such high esteem). Now, almost twenty years later, I am still very proud that I was the driving force to get Sheldon Mayer added to the Eisner Hall of Fame. A few blogs back I talked a lot about western comics. My ever vigilant editor of this blog (That’s you Roger! ), pointed out some of the westerns that he enjoyed and was surprised that I did not mention. He was absolutely right. So I am going to briefly look at the books he thought I overlooked. And he is right, they are all great. First off I want to mention Alex Toth’s Zorro. 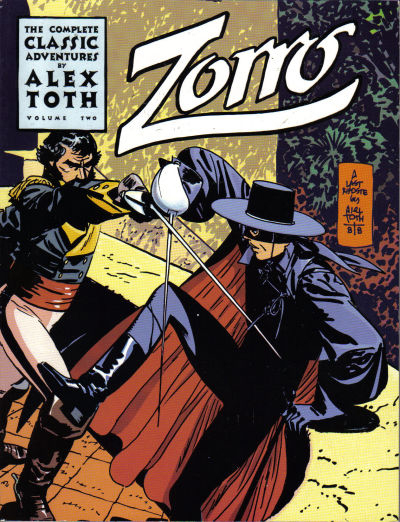 In the late 1950s and early 1960s Dell Comics was publishing a Zorro comic in Four Color Comics (an anthology title) and in the Zorro comic, with art by the amazing Alex Toth. Many consider these stories Toth at his finest, and I would be hard pressed to disagree as they are stunning. The storytelling is a tour de force that you rarely see in comics. These stories have been collected a few times over the years, two very nice volumes from Eclipse Comics in the 1980s and later reprinted by Image Comics in the late 1990s. These stories were also collected into a hardcover collection published by Hermes Press in 2013. Sadly, all of these books are out of print, but they are well worth tracking down if you have the money and time. 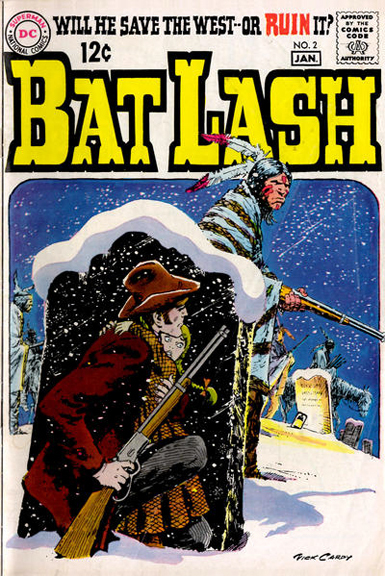 Roger also brought up one of my favorite western characters (along with Jonah Hex), Bat Lash. Bat Lash’s original comic run was by Sergio Aragonis, Denny O’Neil and Nick Cardy. Bat Lash (Bartholomew Aloysius Lash) was a pacifist, ladies’ man, and gambler. I have always thought it was “inspired” by the classic TV show Maverick. 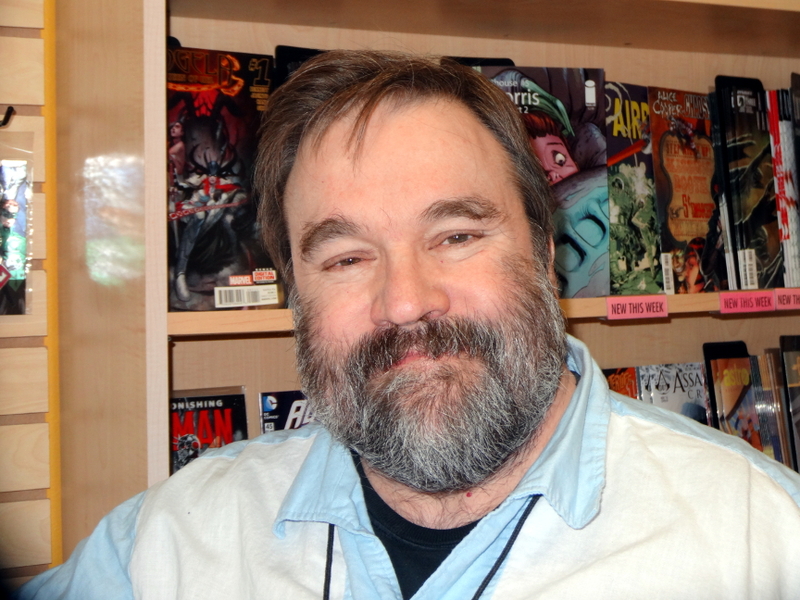 The character first appeared in Showcase and then in seven issues of his own book. Since then he has had numerous appearances in both more miniseries, back up stories and as a guest star. While looking into the background of the character I discovered an interesting story that the rough idea behind Bat Lash, including his name, were devised by Carmine Infantino and Joe Orlando. Carmine and Joe then handed over this rough idea and name to Sheldon Mayer (yes, him again) who, along with Sergio Aragones, developed what became the character we know and love. Mind you, this was years before Groo brought Serio to fame outside of the Mad Magazine fans. One of the best reasons to track down the Bat Lash comics is the art by Nick Cardy. Cardy did a lot of books for DC, including the Teen Titans, Aquaman, and many other books as well as hundreds of covers for DC, so many of which are true classics, yet I do not think Cardy ever gets his due his talent deserves. There is not a lot of Bat Lash material out there for you to sample I am afraid. DC did do a black and white Showcase collection reprinting his first appearance in Showcase (first series) and all seven issues of his own series as well as a number of other stories that he guest starred in. This book came out in 2009 and is long out of print. There was also a second Bat Lash miniseries that ran six issues by writer Peter Brandvold, Sergio Aragones and drawn by the late and amazing, John Serverin. This was also an excellent series with great art that is also out of print. It is about time DC did a Bat Lash omnibus collecting all of his appearances around the DCU. He is a great character that is both humorous as well as dramatic. Really comics at their best. 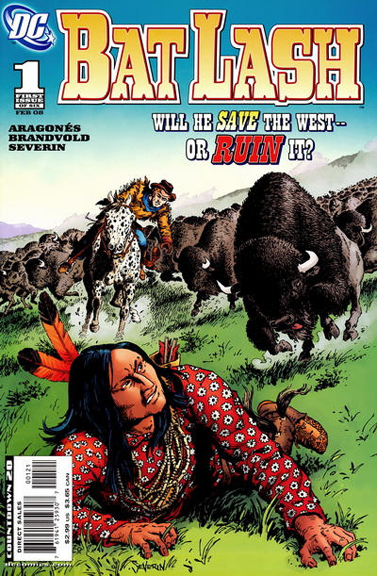 And the art by Cardy and Severin are a western fan’s dream. The third book Roger pointed out to me that I overlooked was Timothy Truman’s Scout. I thought Scout was great, and I still think it is, and I am looking forward to its return. The story was about a Native American named Emanuel Santana fighting the good fight in a dystopic future. I always saw this book as more of a post-apocalyptic story more than a western, but ether way it is great. It ran 24 issues in the ‘80s written and drawn by Timothy and published by Eclipse Comics. 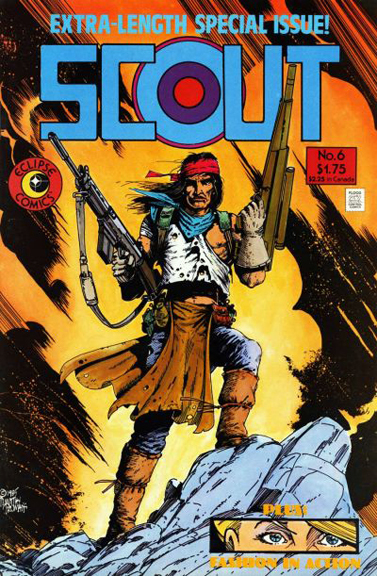 It later came back as a couple of miniseries (not by Truman) and they were followed by a new series called Scout: War Shaman, once again by Truman. Last year Truman did a successful Kickstarter for a new Scout book, but I do not currently know the status of it. (Truman’s still working on it. He sends out fairly regular updates to backers. – Roger the editor) Sadly, there are only two collections of Scout that reprint the first 15 issues. Both of these are still in print and are available from Dynamite Entertainment. Scout was a very good, almost political story more than anything else done in a gritty western backdrop, even though it was set in the future. I really wish someone would collect all of these various stories as this is a highly underrated series. And sadly, one I also had forgotten about. So a big thank you to Roger for pointing out these three books. A couple of quick answers to questions I have received, and the people who read this blog regularly know who they are and these answers are for them. I was asked what good horror books are out there. There are not a lot currently, according to me. IDW ended Craig Yoe’s great ‘50s horror reprint title Haunted Horror. I think the current Immortal Hulk run by Nick Spencer is the closest thing to a great horror comic currently being done. I would recommend Joe Hill’s Locke and Key as a very good series. Not horror in a traditional sense, but very creepy. 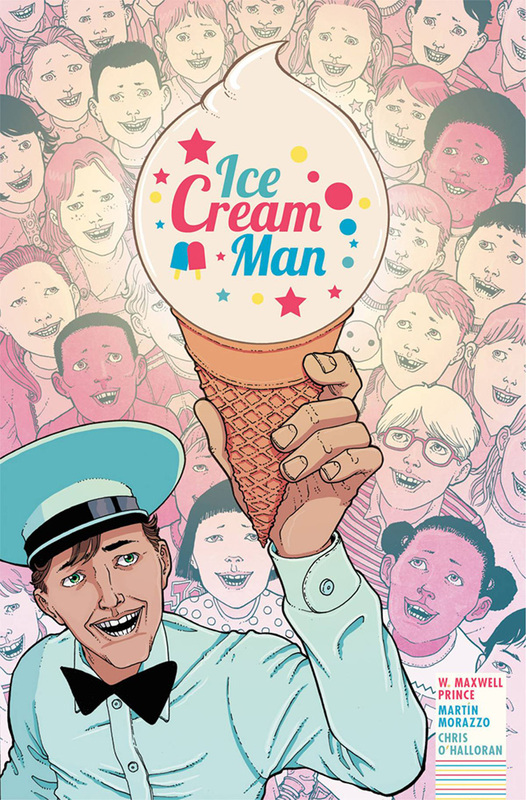 Image’s Ice Cream Man does a nice job of telling stories in the vein of the old EC Comics or perhaps more like Netflix’s Black Mirror. I still love Scott Snyder and Scott Tuft’s Severed with art by Attila Futaki. A truly horrifying story. Also almost anything by Junji Ito, whose work is manga, is still some of the most unsettling things I have ever read. I read far too many new books. On any given week, I read between half to two thirds of what is released. I will be honest, by the time I get around to new books I am like, “eh, new stuff stinks.” I’ve spent all of my time since I finished the previous week’s book reading old stuff or European collections. But every week when I read the new books there are always books that bring me joy and make me excited about comics again. Just talk to me on any Wednesday when the new books hit the stands. Every week there are amazing titles being released by a number of different publishers that are just mind-blowing. But I still love the classic output from the 1940s through the ‘70s. I guess I just love comics in general, even though I read far too many of them. I do not watch many of the TV shows based on comics. I get a lot of grief about this, but it is a matter of time and I think on some level to me, comics are comics and television is a completely different medium and I want something different out of it than I do from my comics. I think I am in the minority thinking this way though. I am often asked if I read comics digitally. I do. I read them any way I can and sometimes digital is the only way and a number of books are done that way ether first, or at times, only, as digital. I prefer print, but I do understand the benefits of digital. As a reader is it nice to be able to manipulate the brightness and size of pages, and at times the lay out is better (fewer ads). On the other hand I am torn because I see what it is doing to the next generations of readers who cannot be bothered with hard copies and do not “collect” comics in the traditional sense. I also see the damage it is doing to the local comic stores and the marketplace I have worked in most of my life. So given the option, I will always go with the print version. But again, I suspect that is because I am an old grump.